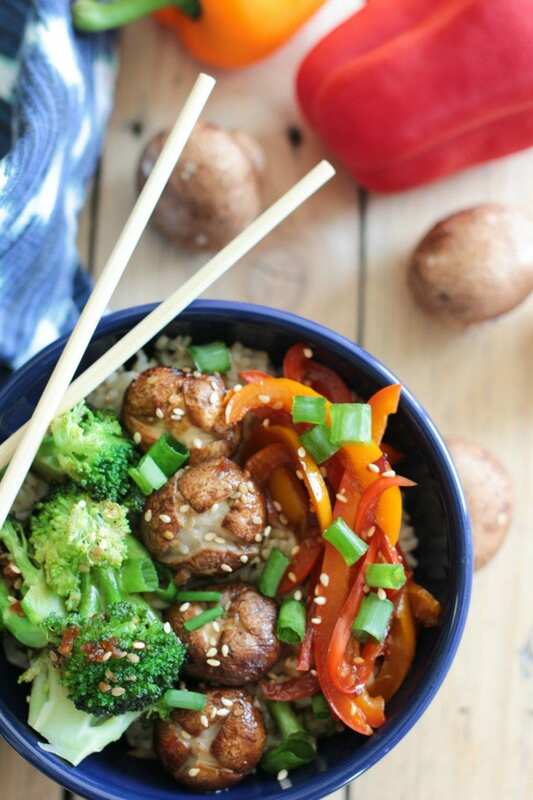 This pepper, broccoli, and whole mushroom stir fry recipe is so incredibly easy and full of amazing flavors. Whether it’s meatless Monday or you’re making dinner for a house full of vegetarians, this is a crowd-pleaser! What started off as a one-month long experiment with my boys trying the vegetarian lifestyle, has now developed into their way of life. It’s been over a year and they’re still going strong. My husband, daughter and I both still eat meat, so it was a challenge figuring out meals. But one I was willing to tackle head-on. Since starting the challenge of cooking more vegetarian meals, I’ve eaten more vegetables and have tried more new vegetables than ever before. (Roasted asparagus anyone?) From keeping them cut up and ready to go in our fridge, to experimenting with them in meals, I’ve actually learned to love (and dare I say crave) vegetables. One thing we eat a lot of is brown rice. I can cook it up in my Instant Pot in less than 30 minutes, plus it’s filling and we all love it. 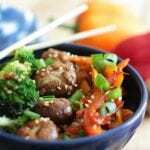 With brown rice as the base, I’ve created some pretty awesome Tex-Mex bowls and Stir Fry Recipes. Including this new one, I’m sharing today! If you only have 30 minutes and you need a healthy meatless meal, this is the one for you. Before we get into the recipe, I want to answer the question you might be thinking…why whole mushrooms and not sliced? I just finished watching season 3 of Chef’s Table on Netflix and my favorite episode featured chef Jeong Kwan (who says she is not a chef) a 60-year-old Zen Buddhist monk who cooks daily meals for her community at the Baekyangsa Temple, 169 miles south of Seoul. She calls her food temple food and watching her create these meals was amazing. There was one mushroom dish she cooked for her father when he came to visit her. He was worried about her way of life and also couldn’t understand how she didn’t eat meat! So, she made him her fried mushrooms, which she says are just as good (and like) meat. He ate her meal and was blown away by how great it tasted. One thing she did to make the meal stand out was to cut little star like shapes on the top of the mushroom. (Pictured above.) It adds a uniqueness to the dish and I love how it turned out. To create the same effect, I took a small knife and cut out part of the top of the mushroom, creating a star on top. This would be something fun to do for guests to wow them. 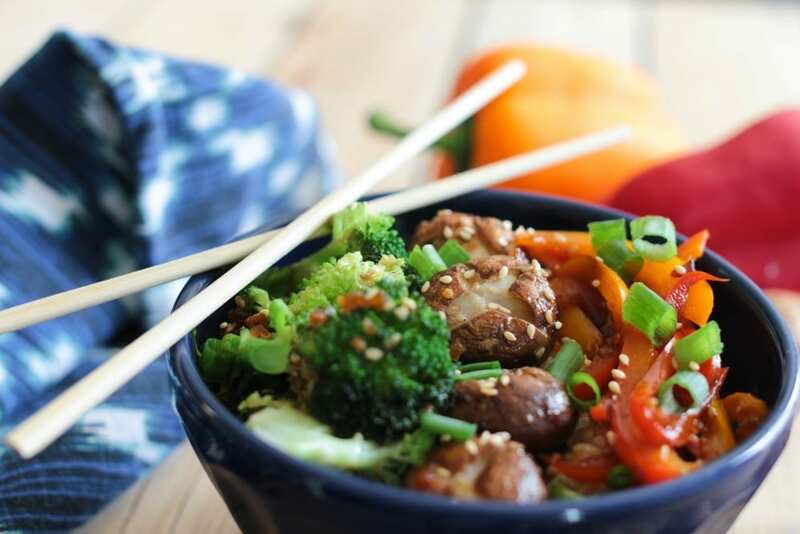 The base of this recipe, which gave it incredible flavor and also helped make the meal come together quickly, is Soy Vay Veri Veri Teriyaki Marinade. They use the finest ingredients around and it has no preservatives and no additives. I picked it up at Target (it’s in the oriental grocery aisle) along with all of the other ingredients. Using this marinade is a simple way to bring flavor to your meal. It doesn’t require a lot of prep, which is huge for me! The simpler, the better. Right now you can Save 20% with the Target Cartwheel app and try it for yourself! Okay, enough storytelling…it’s recipe time. 1.Cut little stars out of the tops of the mushrooms. 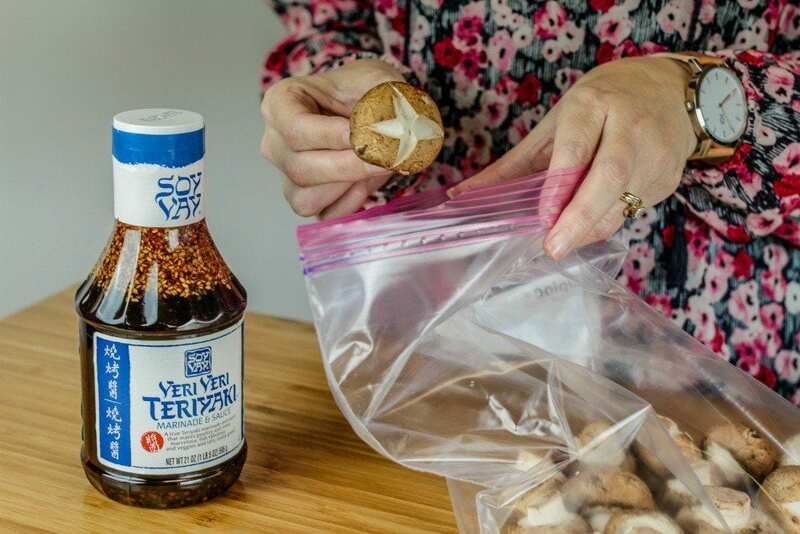 Marinate the mushrooms in the Soy Vay Veri Veri Teriyaki Marinade for about an hour, if you have time. It infuses the mushrooms with major flavor. 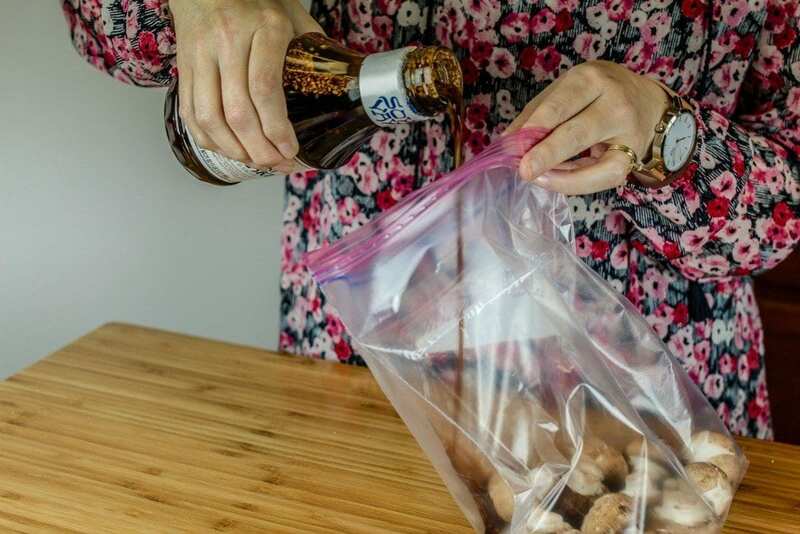 If you don’t have time, marinate them while the rice is cooking. 3. 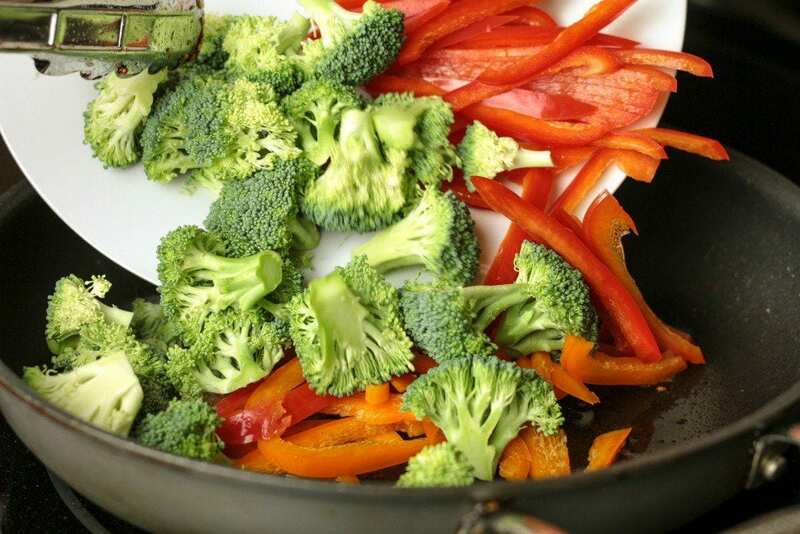 While the rice is cooking, slice the bell peppers and cut up the broccoli into bite size pieces. 4. 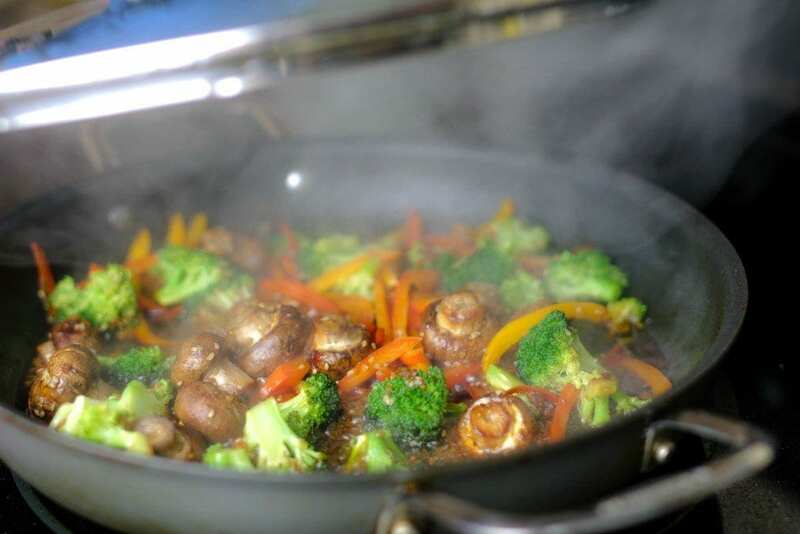 During the last 15 minutes of the rice cooking time, heat a Tablespoon of oil in a skillet. 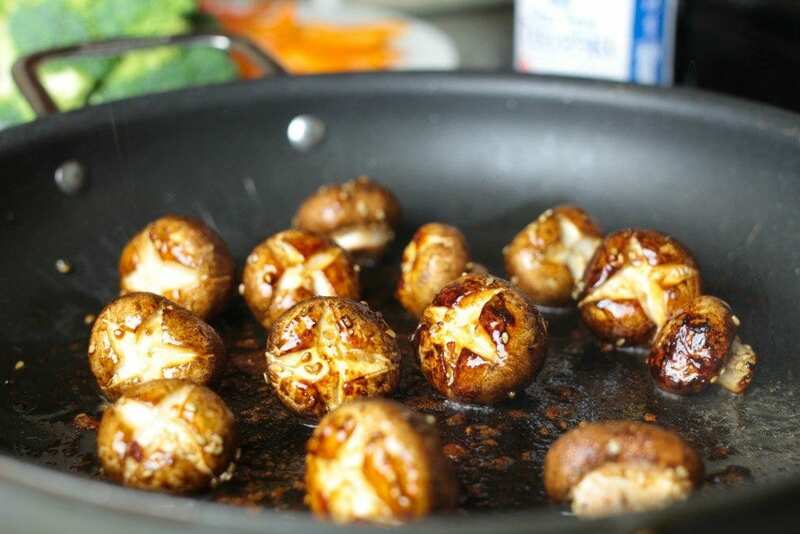 Take the mushrooms out of the marinade and place them in the heated oil. Cook for about 5 minutes, turning the mushrooms. 5. Remove the mushrooms from the skillet and set aside. Add a little more oil if necessary. Add the peppers and broccoli and cook for 2 to 3 minutes until the peppers start to get a little soft. 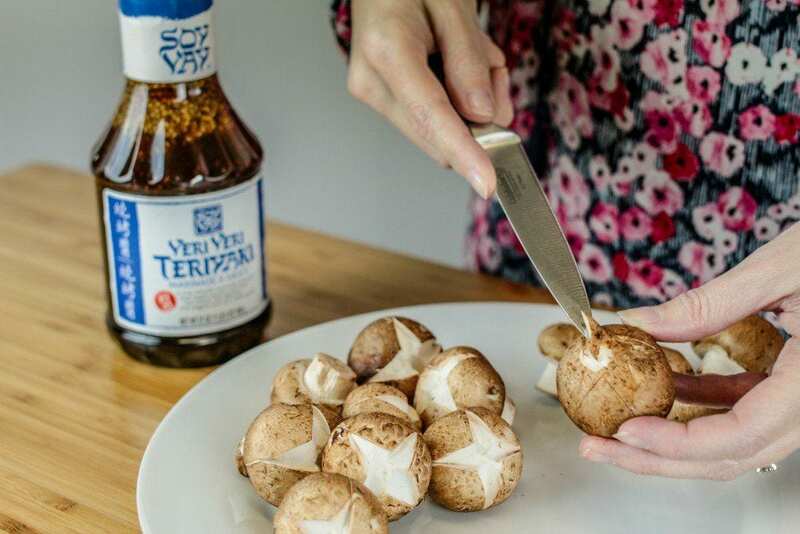 Add the mushrooms back to the skillet and pour some Soy Vay Veri Veri Teriyaki Marinade over the vegetables to coat. Put the lid on and cook for another 5 minutes. The broccoli should turn a bright green and still be a bit crisp. 6. 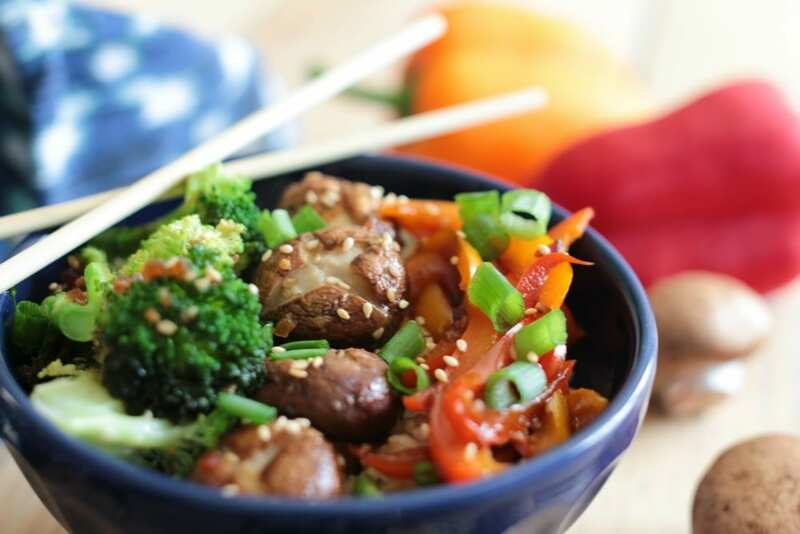 Fill a bowl with rice and top it with a row of mushrooms, peppers and broccoli. Garnish with sliced green onions and toasted sesame seeds, if desired. Eat (with chopsticks of course) and enjoy! I’m happy to say that this recipe made this once hater of mushrooms, actually like them! There’s something about eating them whole + the flavor from the marinade + frying in oil that made the texture incredible and the flavor off the charts. I never in a million years thought I would enjoy mushrooms. Does that make me a grown up now? This pepper, broccoli, and whole mushroom stir fry recipe is so incredibly easy and full of amazing flavors. Whether it's meatless Monday or you're making dinner for a house full of vegetarians, this is a crowd-pleaser! 1. Cut little stars out of the tops of the mushrooms. 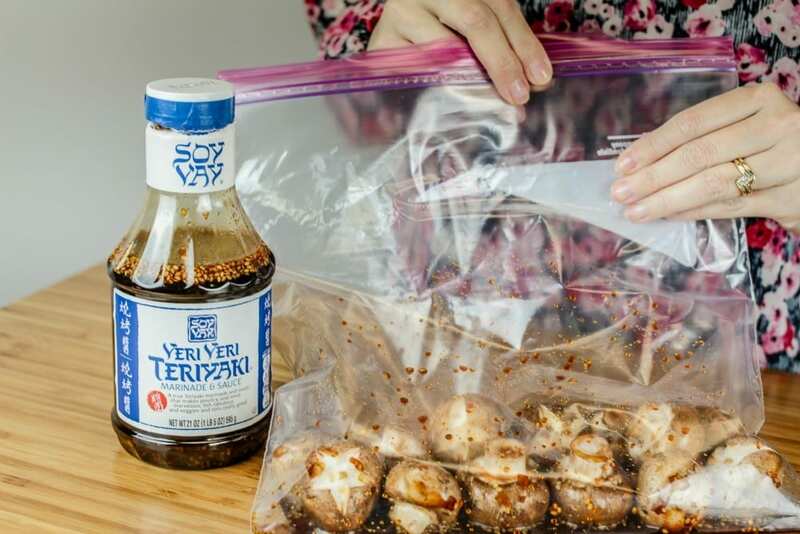 Marinate the mushrooms in the Soy Vay Veri Veri Teriyaki Marinade for about an hour, if desired. It infuses the mushrooms with major flavor. If you don't have time, marinate while the rice is cooking. 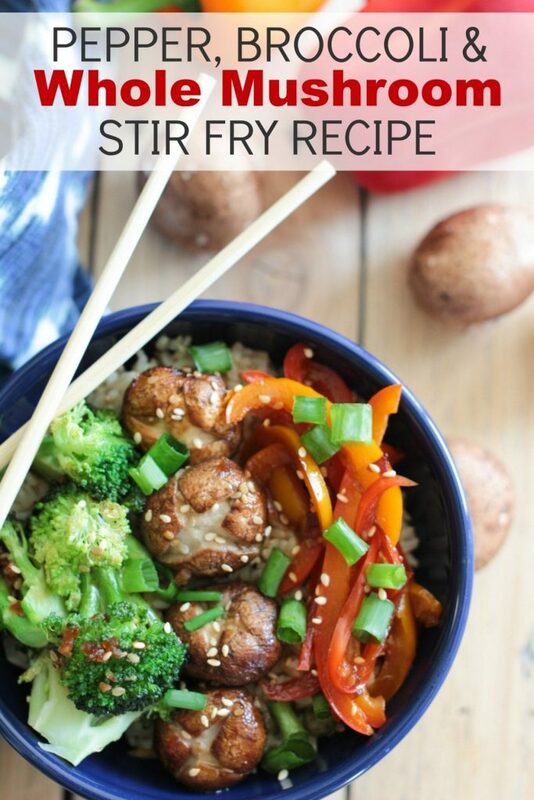 If you enjoyed this Pepper, Broccoli and Whole Mushroom Stir Fry Recipe, please share it or pin it on Pinterest to save for later!